Spa Sensations 4'' Memory Foam Mattress-Topper; Size: Twin by Spa Sensations at Oxygen Salon and Spa. MPN: 4340757444. Hurry! Limited time offer. Offer valid only while supplies last. The Spa Sensations Theratouch Memory Foam Mattress Topper cradles you in comfort, as it molds to the natural shape of your body for customized sleep. 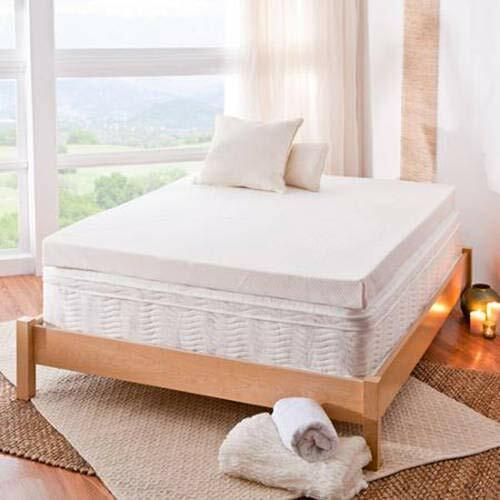 The Spa Sensations Theratouch Memory Foam Mattress Topper cradles you in comfort, as it molds to the natural shape of your body for customized sleep. Rejuvenate your current mattress or enhance your sleep experience with this dual layer memory foam topper. The latest evolution of memory foam, BioFoam, replaces some of the traditional petroleum with natural plant oil, and includes natural green tea extract and all natural active charcoal to help absorb moisture, eliminate odors, and keep your mattress topper fresh. The premium cover is removable and washable with non-slip fabric on the bottom of the topper. Please open your mattress topper within 72 hours of receipt and allow 48 hours for it to return to its original, plush shape. Another comfort innovation from Zinus. Pioneering comfort. If you have any questions about this product by Spa Sensations, contact us by completing and submitting the form below. If you are looking for a specif part number, please include it with your message.